I, like so many others, love finding really small holes-in-the-wall that serve good food at really low prices. One that S and I like a lot, which we discovered through another local blogger, Cheryl, aka the baker who cooks, is Miss Clarity Café, on Purvis Street. S, in particular, has become addicted to the club sandwiches in this brightly colored, affordable eatery; they are, I must admit, some of the very best, biggest, tastiest and cheapest club sandwiches in town. I’m also a big fan of their oxtail and the fact that there’s free wireless broadband–something every blogger likes to have available. Another “cheap eats” that I’ve been going to a lot recently is a tiny café run and staffed by a young couple named Anthony and Ivy. Café Divine is on the second floor of The Adelphi, a shopping centre on Coleman Street, opposite Funan Centre, a well-known computer and electronics mall here. The café itself is tucked away, close to the entrance of the overhead bridge that connects the two malls. As mentioned, it’s small, really small. It can seat maybe 18-20 people at its fullest. And at lunch on weekdays, it’s always full. In fact, not only is the café regularly packed with happy, hungry customers having their lunches, but there’s always a line of equally hungry (but since they aren’t the ones eating, obviously unhappy) customers, waiting for one of the few, and thus very valuable, seats. The café’s interiors are rather non-descript–it’s really just a space with some tables, chairs, a fridge for drinks, a counter and a small, open cooking area–but that only adds to the appeal. The focus here is on food–good, simple home-cooked food, and nothing else. Anthony, who cooks and serves (Ivy takes orders and serves) is really quite impressive. His cooking area, just like his restaurant, is small and humble. It consists of two woks, one filled with oil for deep frying and one for everything else. He also has a small fry pan which I’ve never seen him use. His menu consists of a big variety of Western, Japanese and local dishes. The most popular dish, from what I’ve witnessed, is the fish and chips. Friends and colleagues tell me that the cajun salmon is equally good. Also very popular is his fried rice and two hor fun dishes (beef and seafood). I’m particularly fond of his pastas, especially his version of spaghetti carbonara. And almost all of it, as I said, is cooked in the same wok. Which gives the spaghetti carbonara this wonderful “wok hei” flavor that you’d never taste if it was cooked in an Italian kitchen. “Wok hei”, for those that don’t know, means “breath of the wok” and refers to a much-sought after and deliciously smoky taste that food cooked in a well-used cast iron wok over high heat can take on. 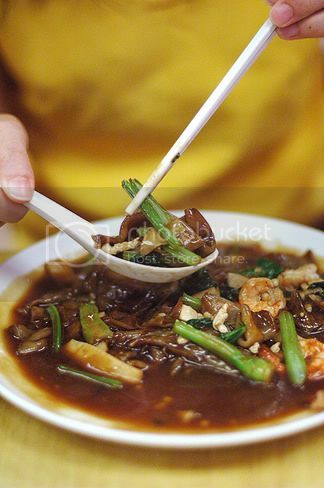 I love foods that are imbued with “wok hei”. 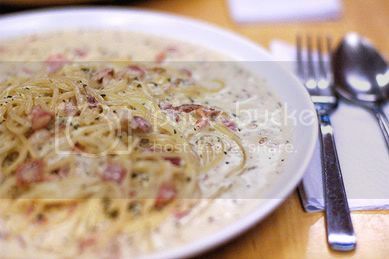 Which is why, despite the fact that the carbonara here is hardly traditional or that authentic, to me, it tastes great. Of course, that Anthony ladles his carbonara with an enormous amount of delicious, smoky rich cream sauce just makes it that much better in my book. Anthony’s food is good. It’s served fast and served hot off the wok. It’s also very, very reasonable, which is another (and possibly the main) reason why the place is so often packed. None of the main courses run more than S$5. Some are even under S$4. Which for my colleagues and I, when we consider how much we might pay for worse food at other nearby cafés, fast food chains or restaurants, makes Café Divine a pretty simple choice when deciding where to lunch. Of course, no owner-operated café would survive if the folks who ran it weren’t supported by regular patrons. Which means they have to be the kind of people you want to support. I’ve never really spoken much with either Ivy or Anthony, but from the little I know of them, I’m pretty confident in saying that they’re good people. They’re always cheerful, even when faced with a line of impatient, hungry office people. They’re really accommodating. And they work damn hard. Which I totally respect. And just one more reason why I keep returning. Anyone knows what are their operating hours ? Are they only open for lunch or for dinner as well? Thks for de heads up on Aldephi & Clarity Cafe. My workplace is ard Marina Sq. U knw sometimes U get so sick & tired of the fd ard Suntec & Marina area that one runs out choices. I suspect that Miss Clarity Cafe’s kitchen standards and service suffer at peak hours like lunch & dinner time because they have a very small team of people. I actually like going there for breakfast (they open at 7.30 on weekdays). Love their club sandwich. In terms of mains, it’s true that standards have slipped since they first opened. This is particularly so if you go when the restaurant is filled with large groups of people. I go to Cafe Divine at least once a week and it’s really as good as you’ve described. The fish cajun (some white fish, not salmon) is really really good, along with the fish and chips. I must try the cabonara the next time after seeing your pic! The trick about this place is to go early, around noon, or late, say 1.30pm. Or just da pow if you work around the area. Congrats to S on making the best dressed list! I didn’t know what “wok hei” is, though had certainly tasted it before. It doesn’t come out of my wok at home nor does it seem to come out of all woks, but love it when I taste it. Thanks for shedding light on that. Any idea where cafe divine moved to?